Boyertown, PA (December 2012) – Gateway Ticketing Systems is pleased to announce that the Fullers Group Ltd. has chosen Gateway’s flagship product, Galaxy™, for their ticketing and access control software. Fullers Group, located in New Zealand, has been the leading ferry operator in Auckland for over 20 years. 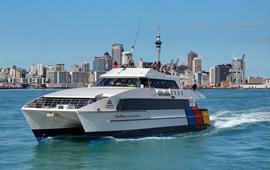 The company offers a wide range of ferry trips, tours and charters in Auckland Harbour and the Hauraki Gulf Islands. Installing Galaxy on the ferry and tour vessels will enable Fullers to combat potential theft and fraud. By printing tickets on demand, rather than using preprinted ticket products, there is less opportunity for ticket theft or loss. And Galaxy’s Pass Module means that Fullers can now issue monthly photo passes to more easily verify pass holders. The Galaxy Admission Control module will provide clear and accurate ridership numbers, allowing Fullers to make the best possible operational decisions and to track usage on passes. Admission control will also provide their Marketing department with more information so they can created targeted promotions, including the Galaxy Packages module, Galaxy Loyalty programs and Galaxy Upsell opportunities. Gateway Ticketing Systems and its employees are thrilled to welcome Fullers Group to the Gateway family and look forward to a long and successful relationship.